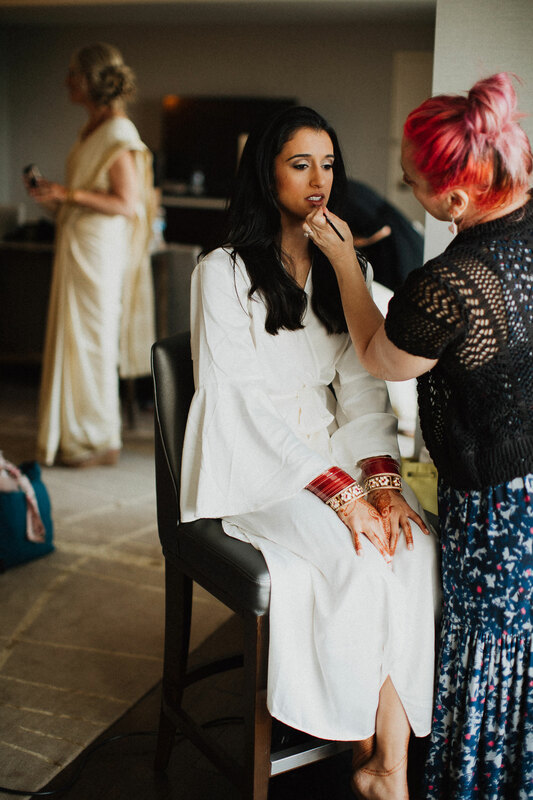 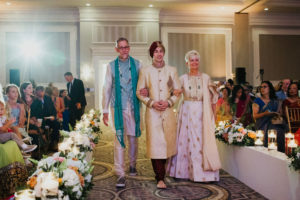 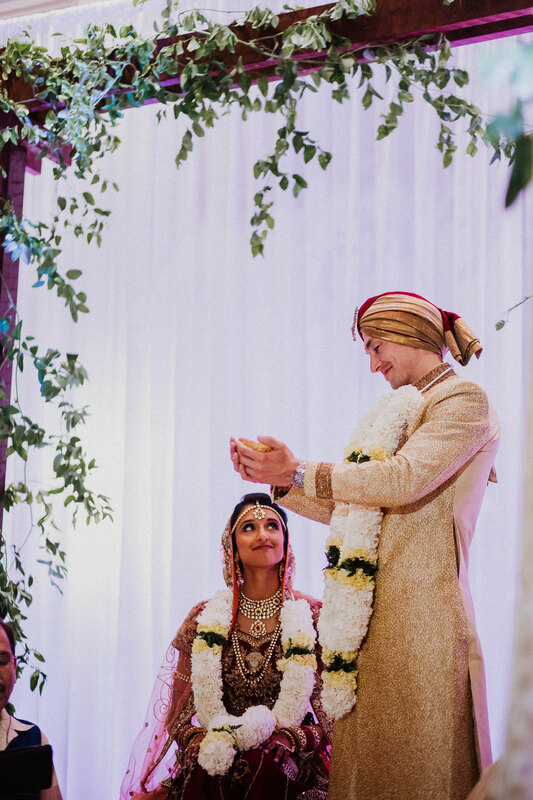 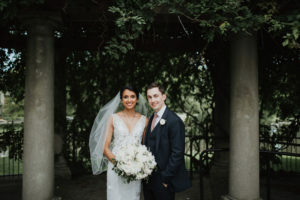 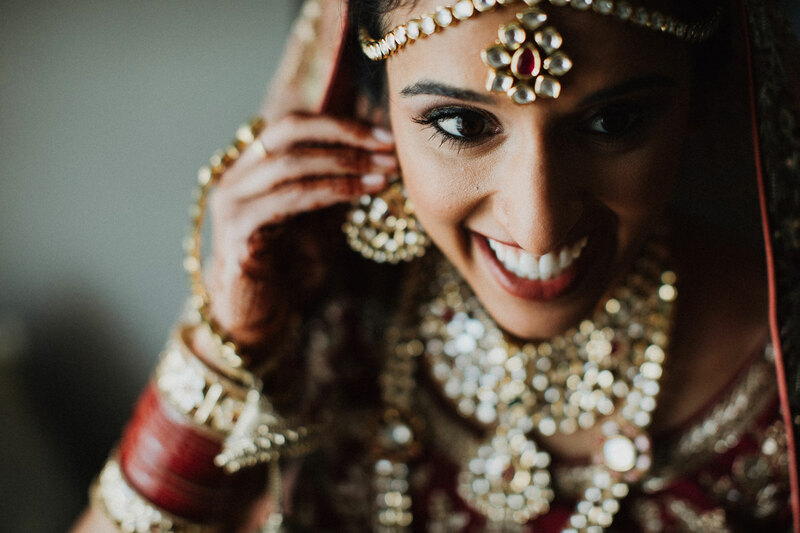 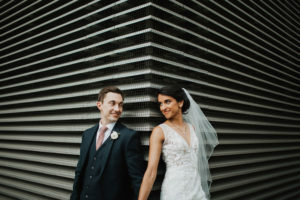 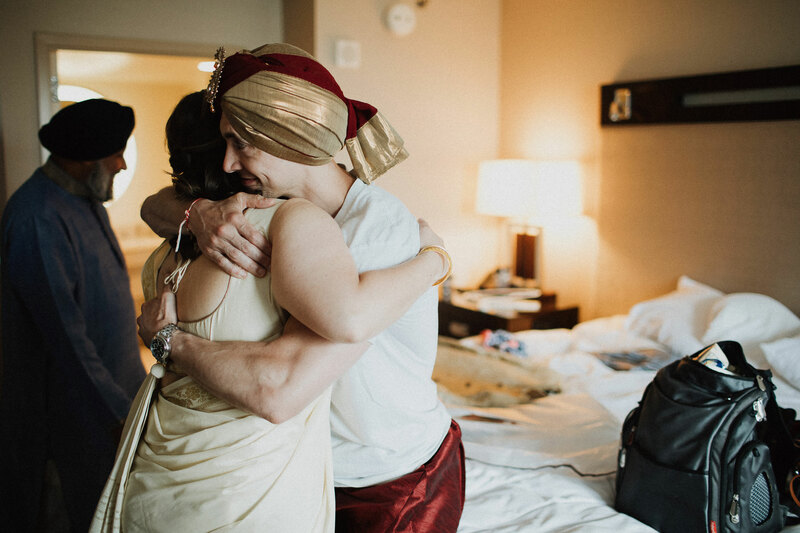 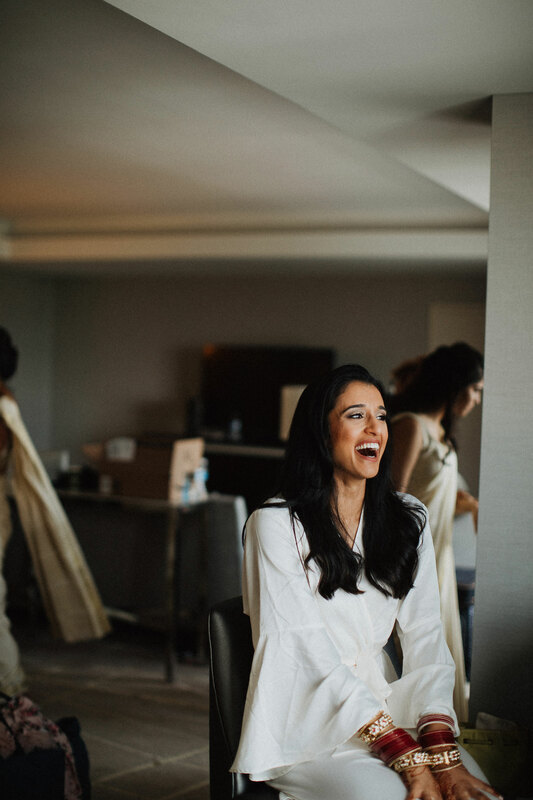 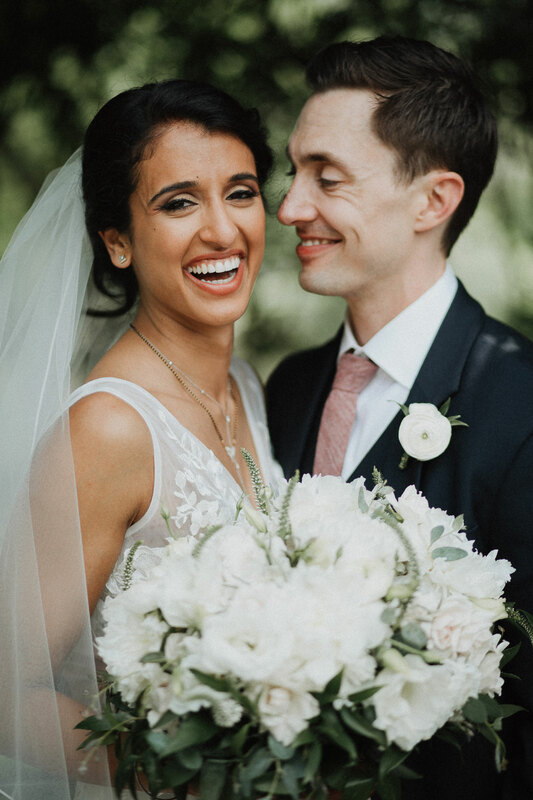 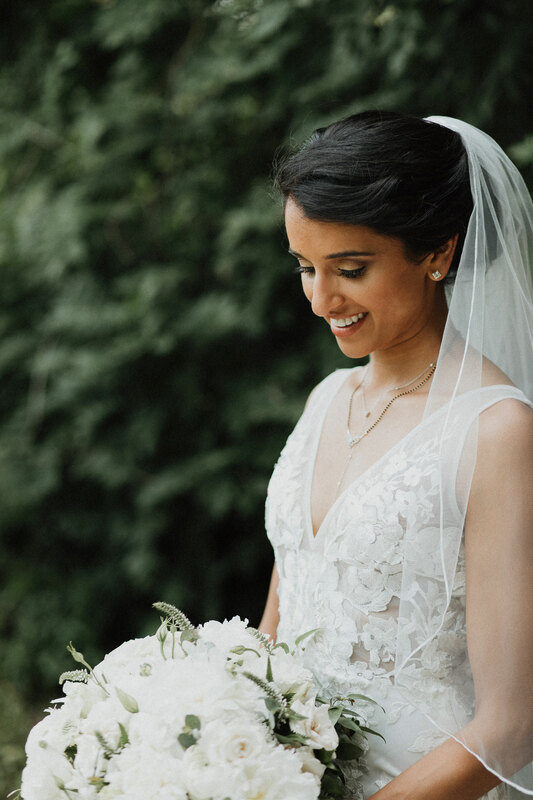 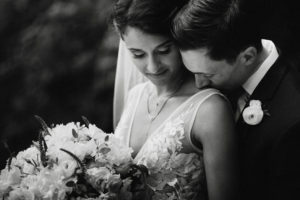 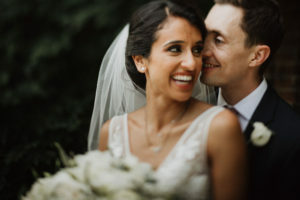 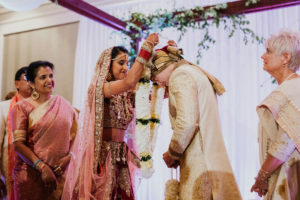 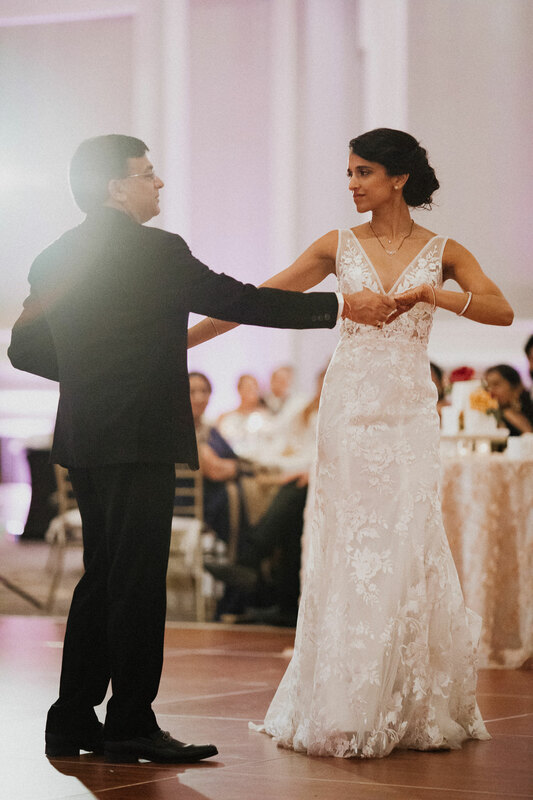 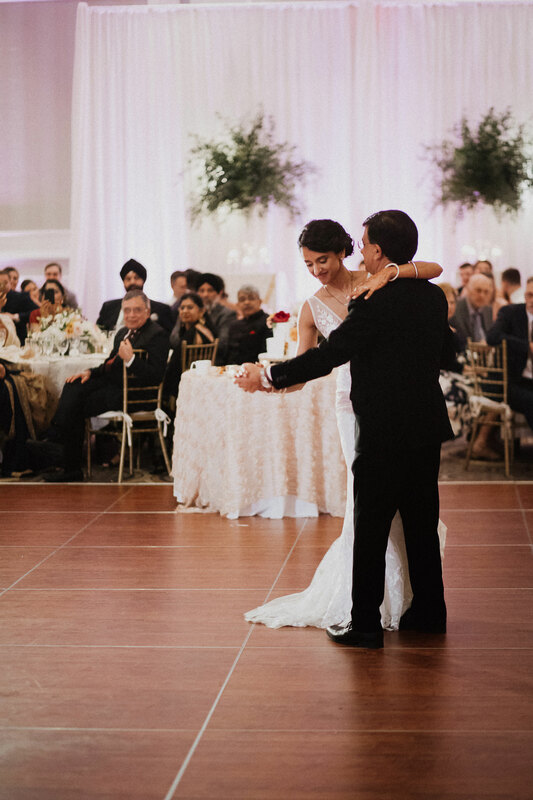 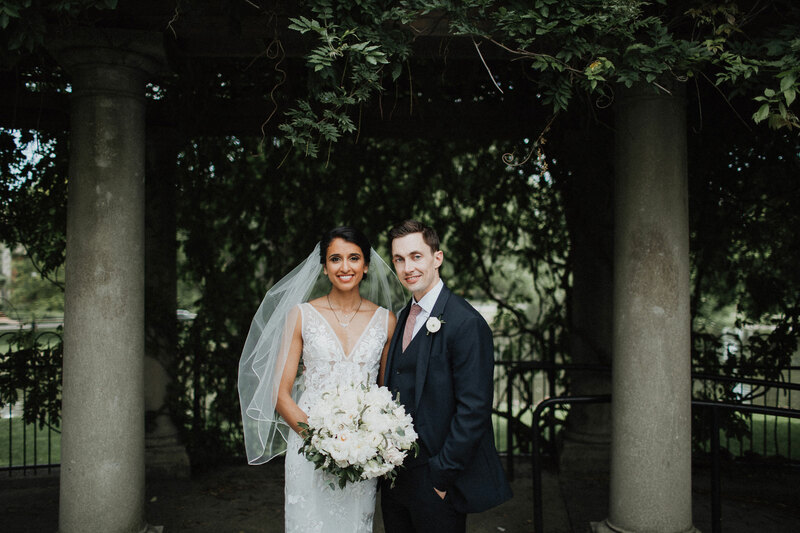 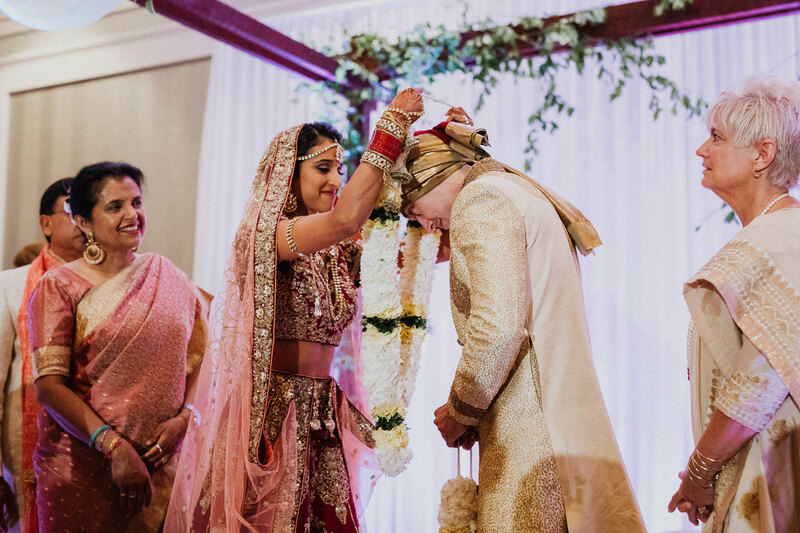 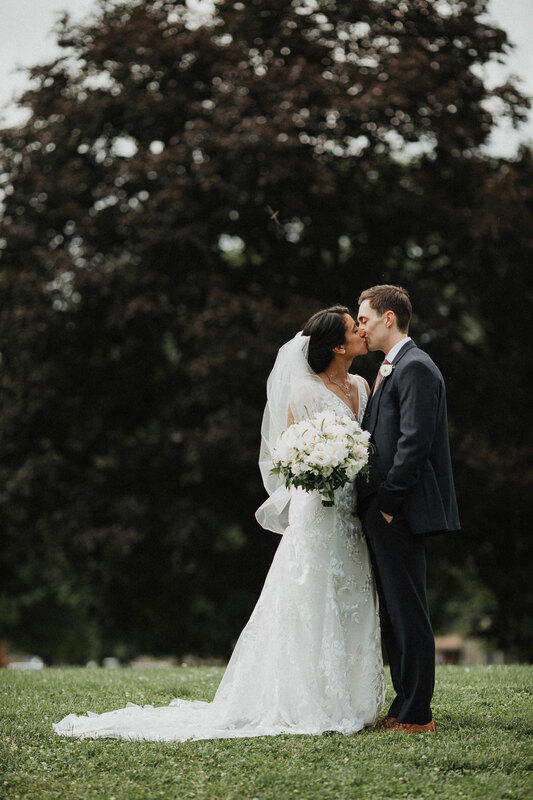 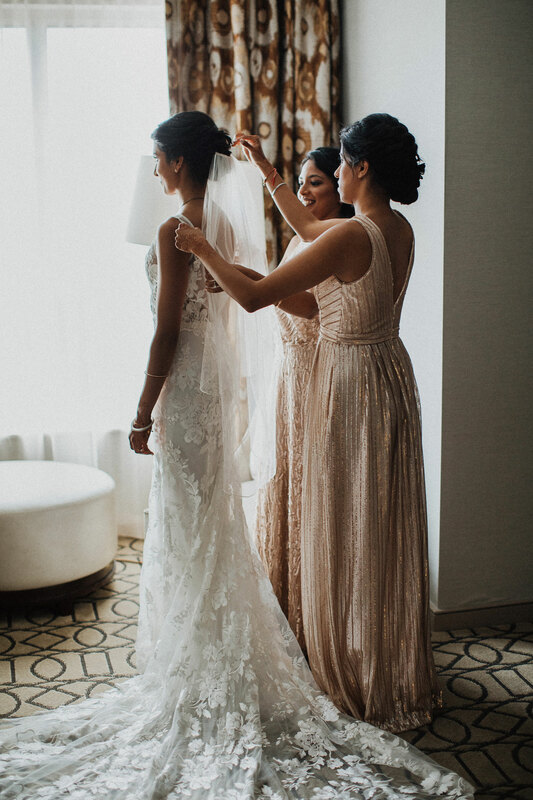 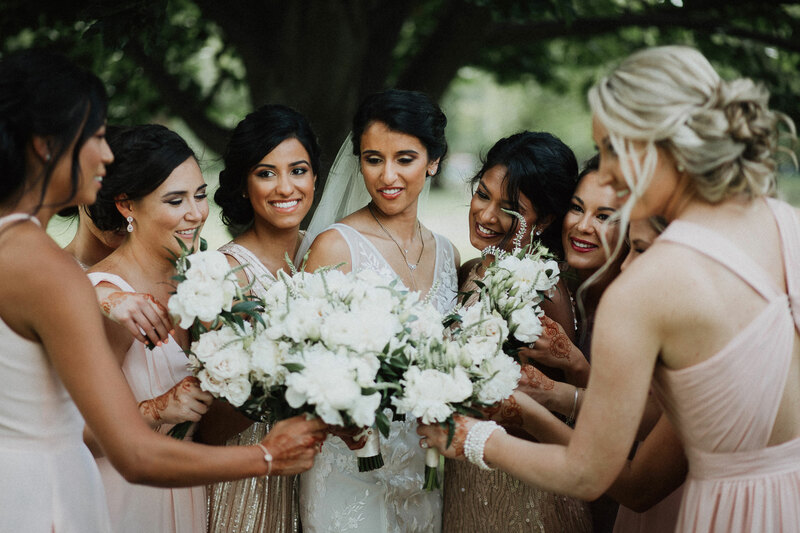 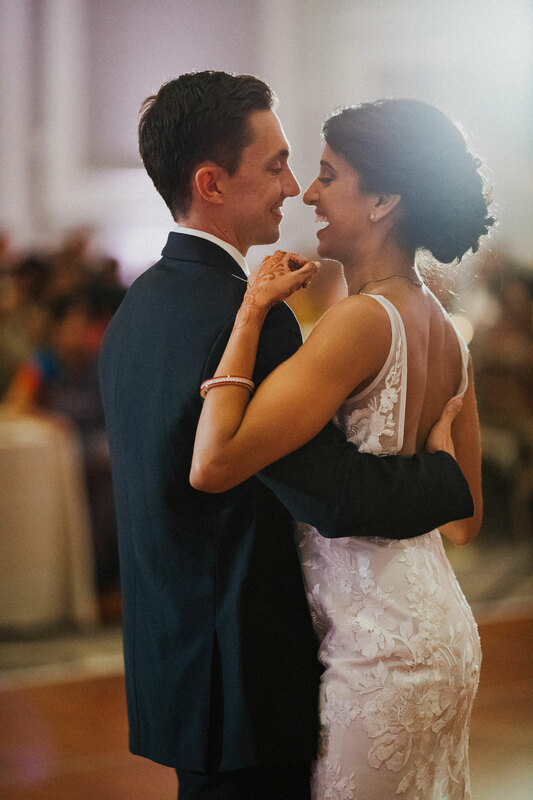 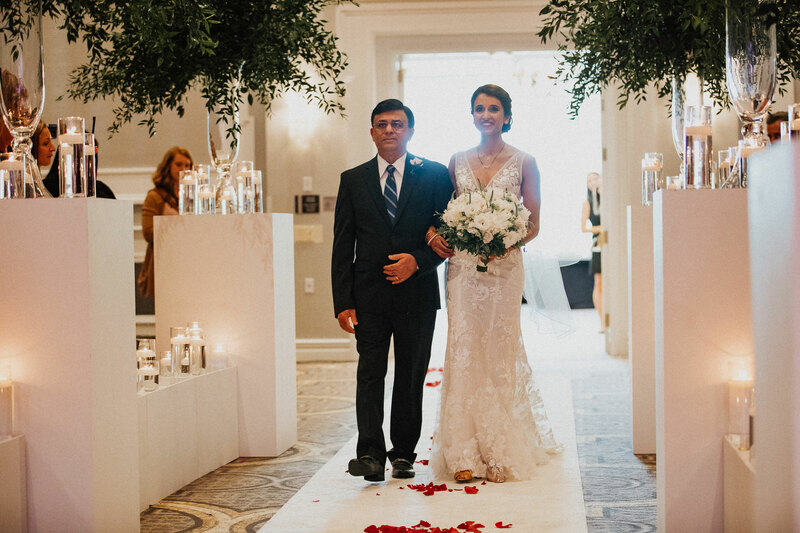 When I first began this journey with Natasha and Ronnie, we were working to perfectly blend Natasha’s Indian heritage with Ronnie’s Catholic background, and to pay respect to both family traditions while keeping it all true to who Ronnie and Natasha are. 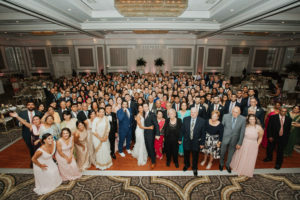 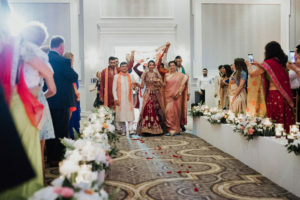 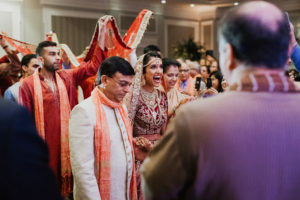 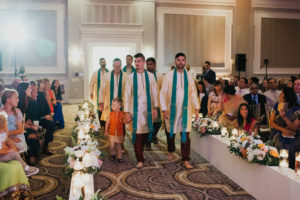 The wedding day, that consisted of an Hindu ceremony, a Western ceremony, lunch, cocktail hour, dinner and dancing, was all held at Hilton Easton. The day was full of travel and cultural influences that showed elegance and personal details that brought it all together. 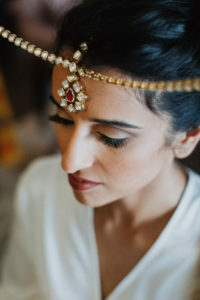 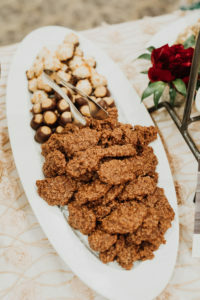 We have worked on several Indian-Western fusion weddings over the years. The traditions and ceremonies from Indian cultural are so intricate and beautiful. 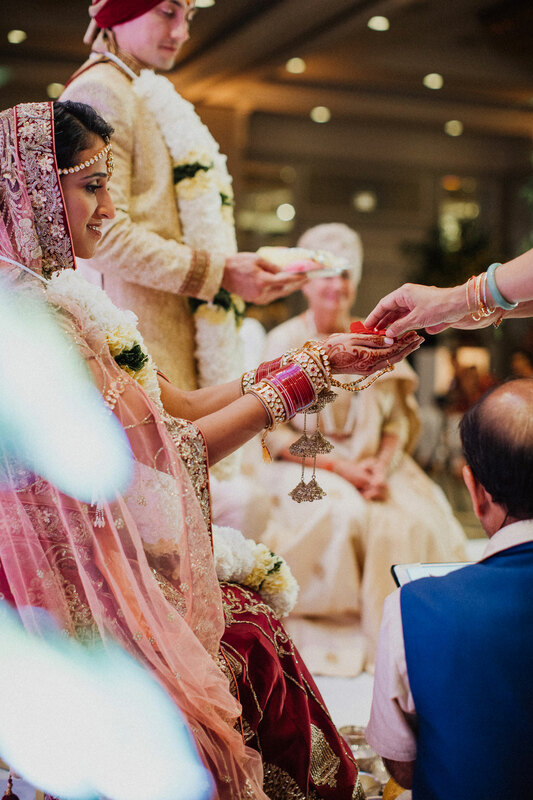 A typical Indian wedding is a huge celebration that lasts for several days. Natasha’s family had the sangeet near Dayton, where they currently live and where Natasha grew up. 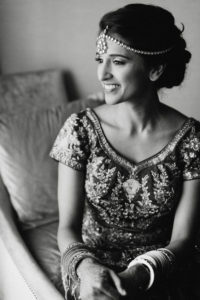 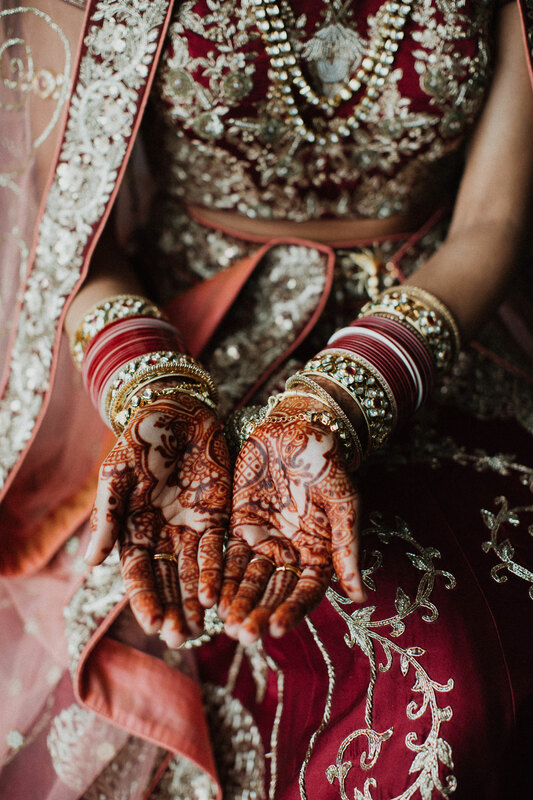 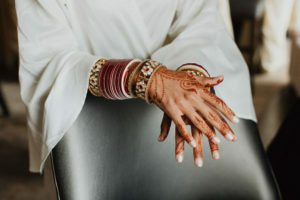 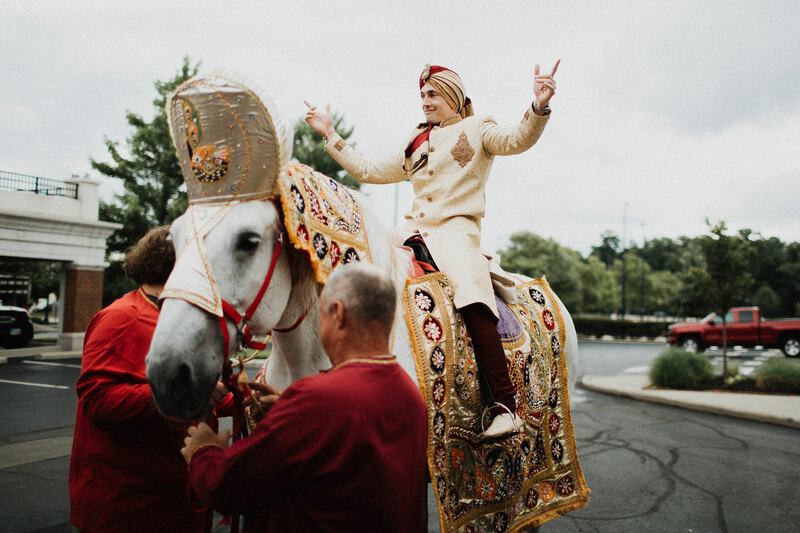 On the wedding day, Ronnie came in on a horse in a traditional Baraat ceremony, and Natasha was adorned with beautiful henna. 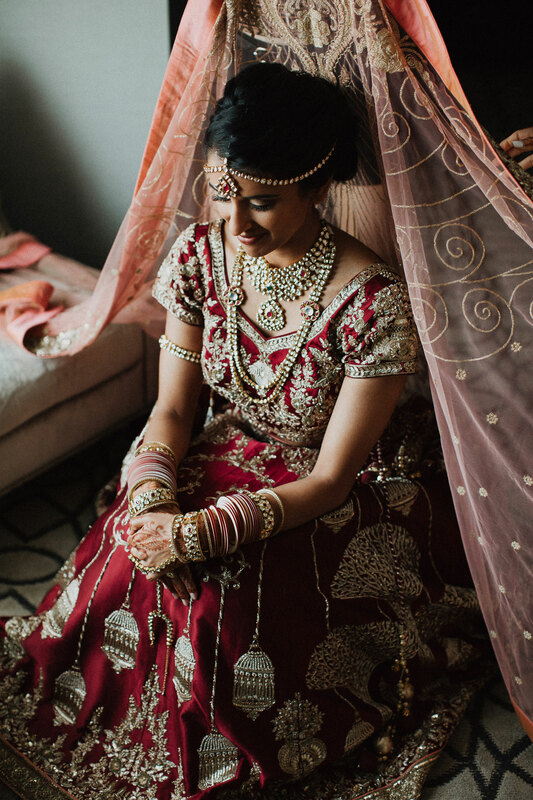 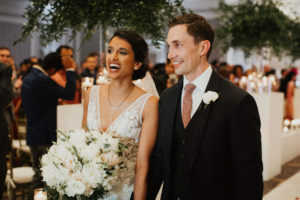 Standing under a Mandap wrapped in fabric and florals, Natasha wore a beautiful deep red and gold wedding sari and Ronnie wore a traditional, ivory sherwani. 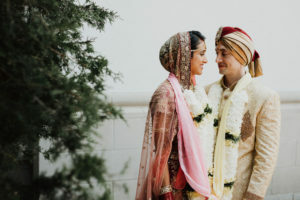 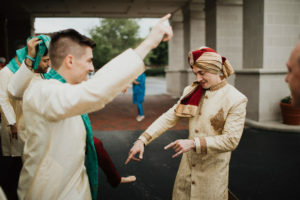 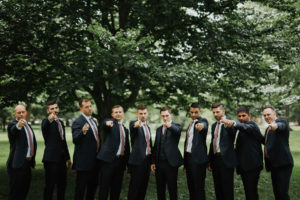 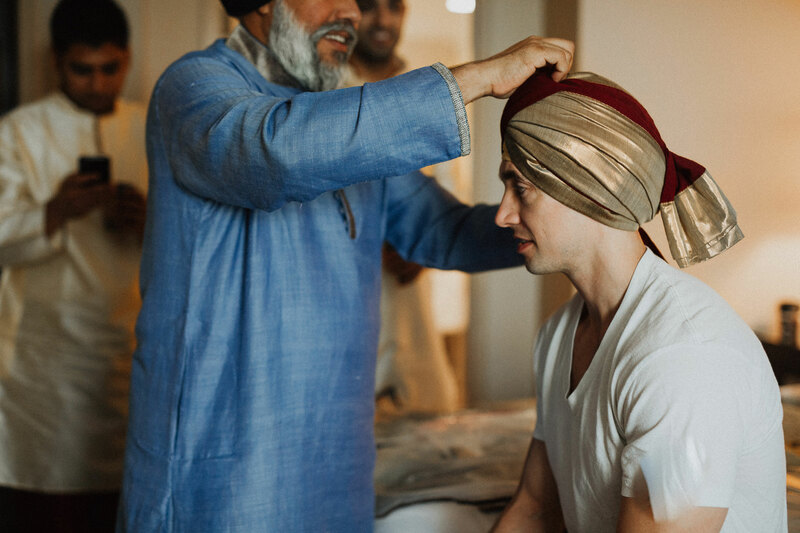 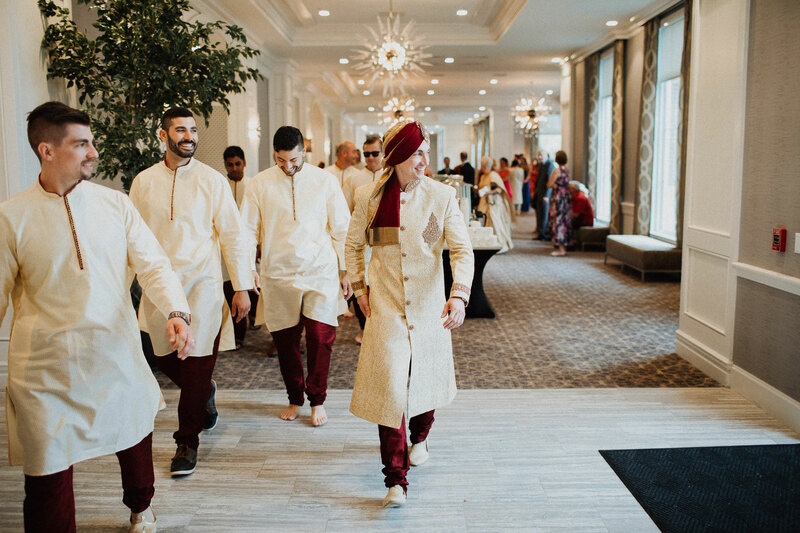 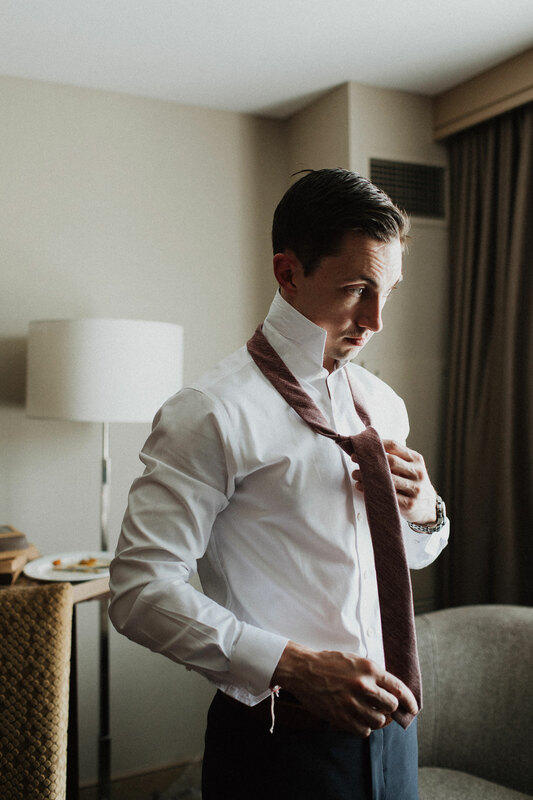 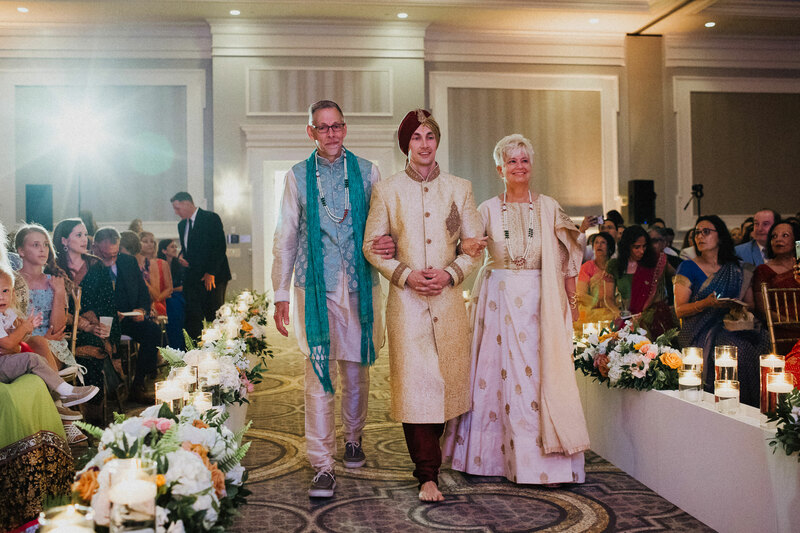 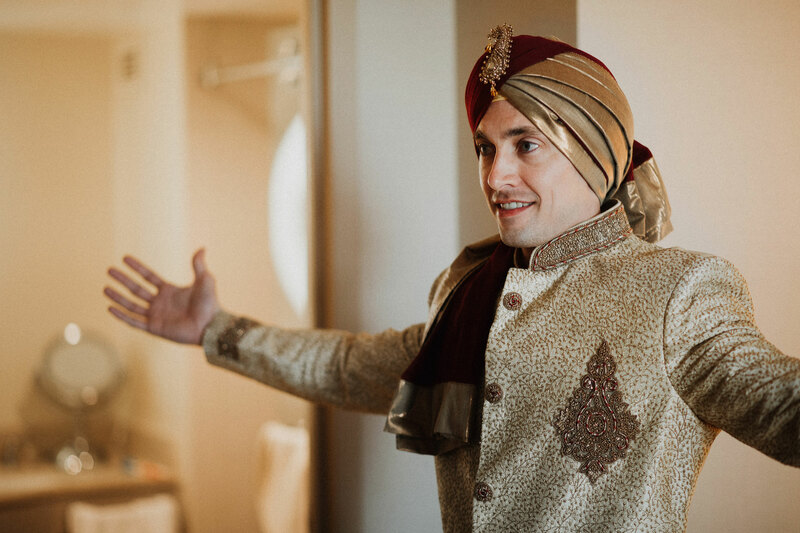 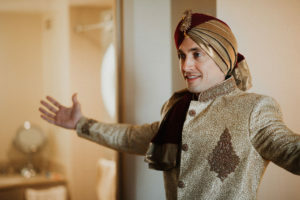 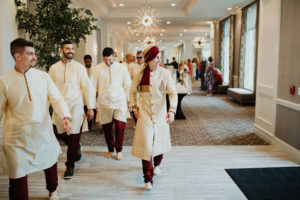 Before the wedding, they were lucky enough to travel to India with their families and choose the perfect wedding attire. 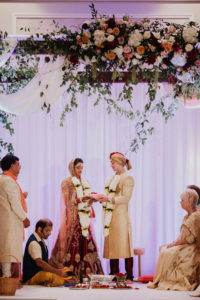 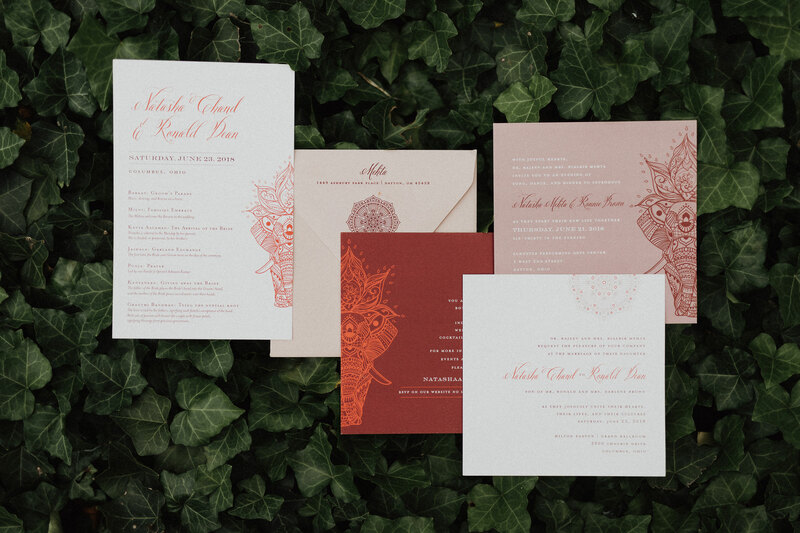 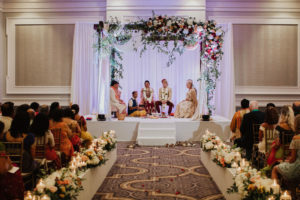 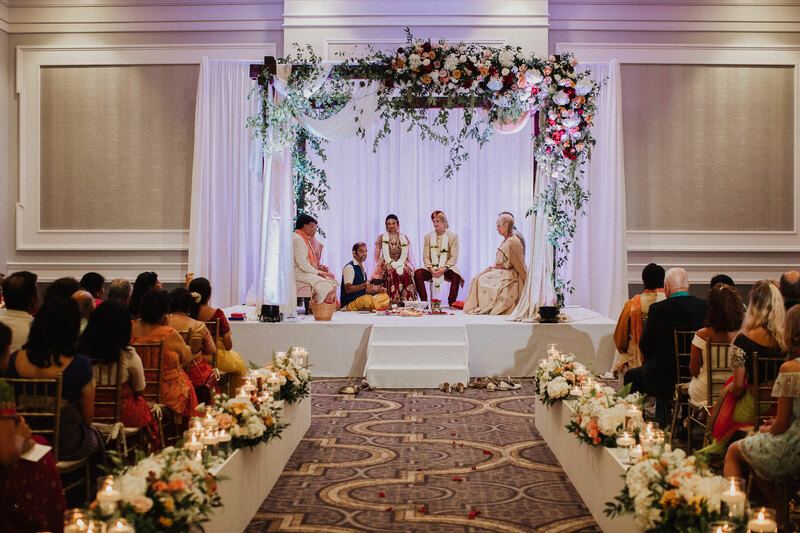 Our vision for the Indian ceremony was a pop of deep red mixed with mauve and rose tones and a hint of ivory and gold. After a short lunch, Ronnie and Natasha had a second ceremony following a more traditional Western ceremony outline. 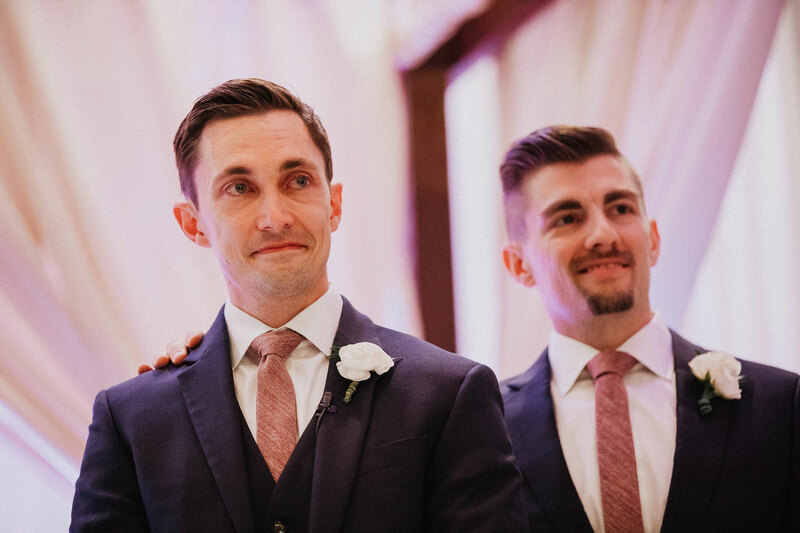 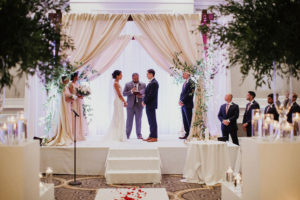 The vision for this ceremony was to keep it clean and simple with shades of white and ivory, and pops of green…and we had less than one hour to make it happen. 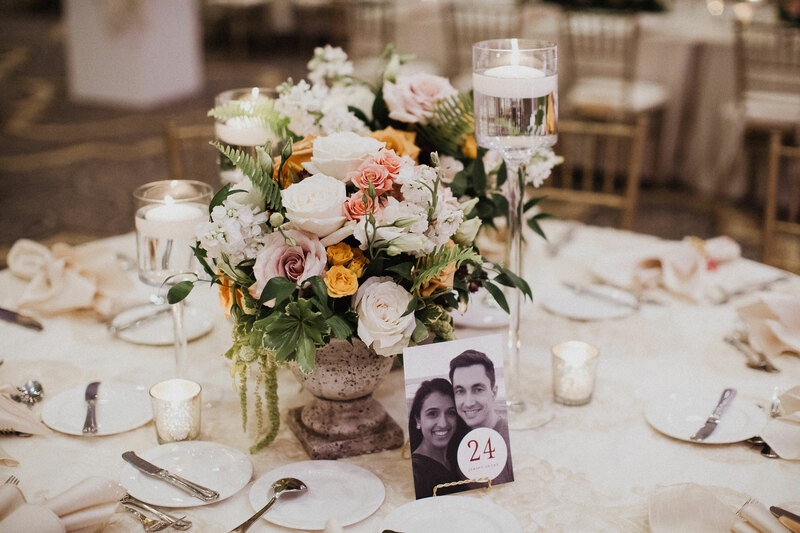 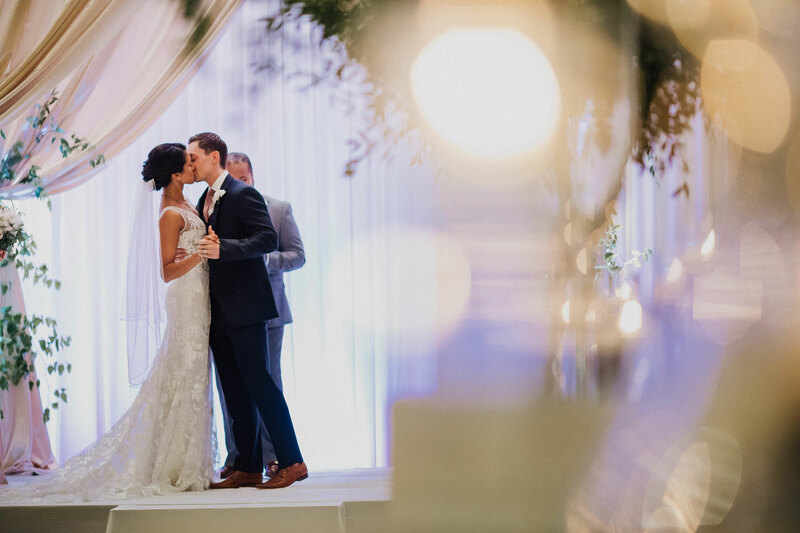 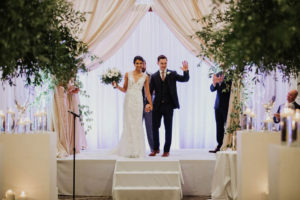 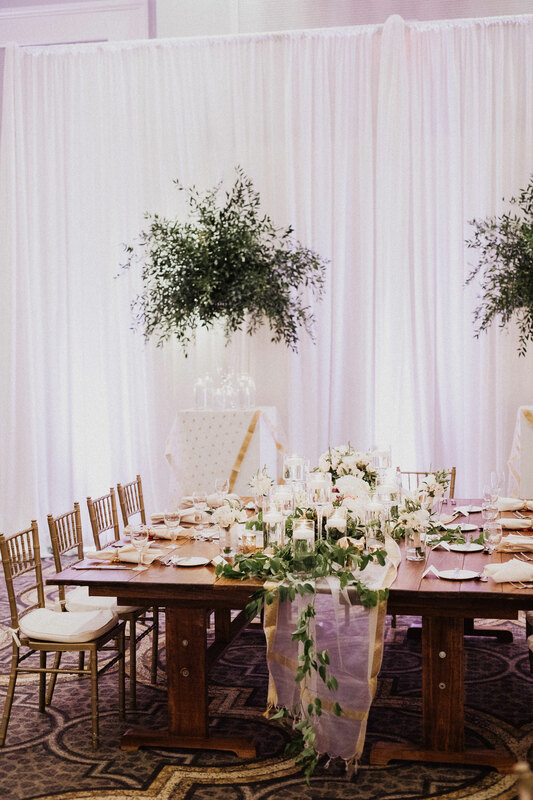 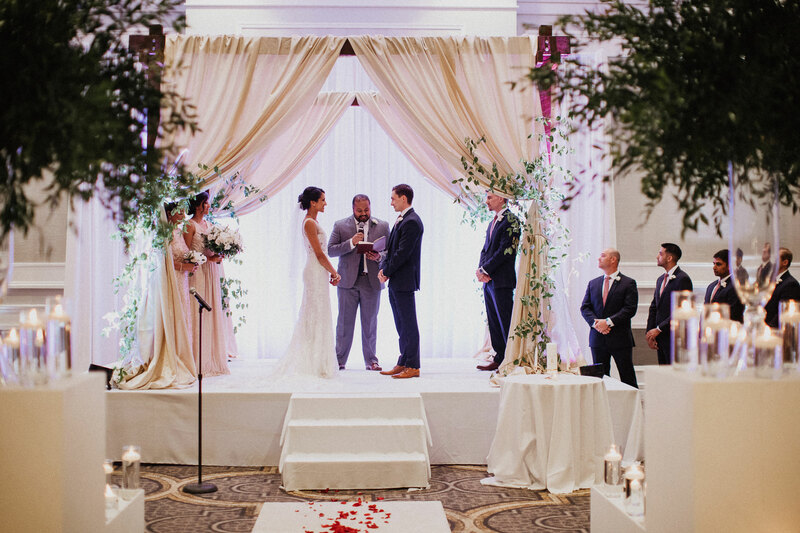 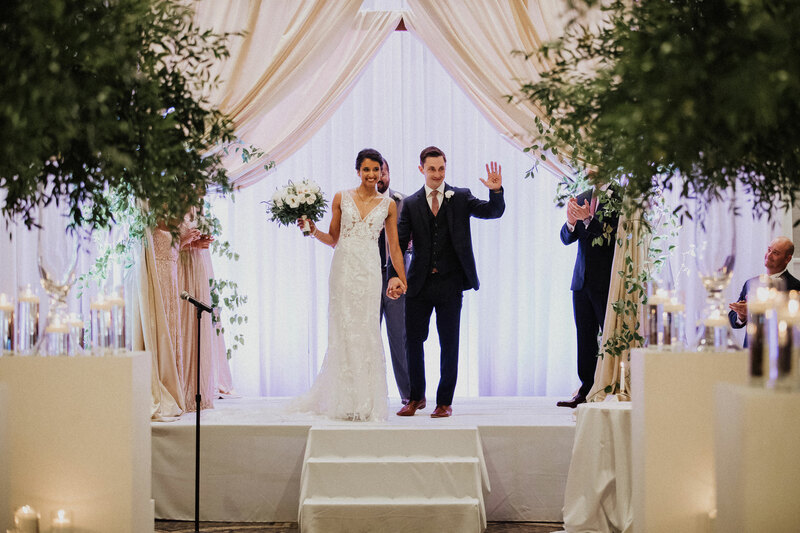 Natasha and Ronnie love to travel and explore the outdoors – Rita, with Prema Designs created large green arrangements to bring the outdoors in, and created a dramatic aisle with candle light leading to the ceremony arbor. The outcome was perfect as each element pulled together as our team of vendors worked through the day. 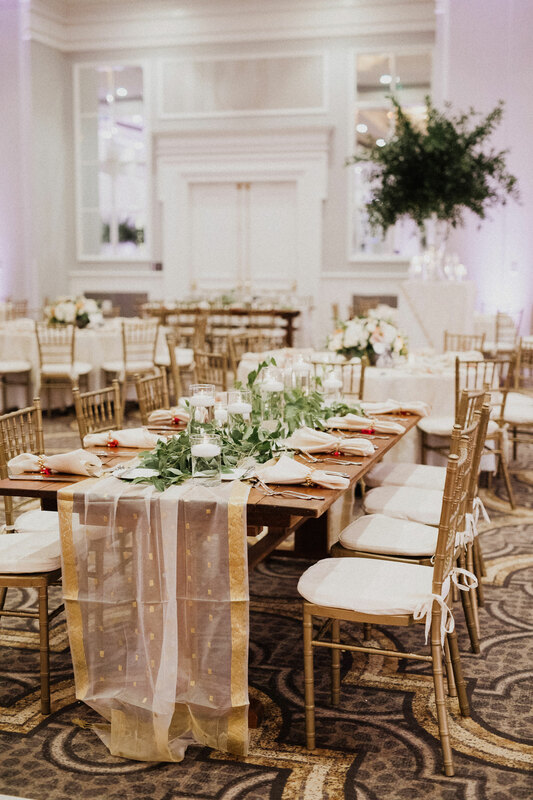 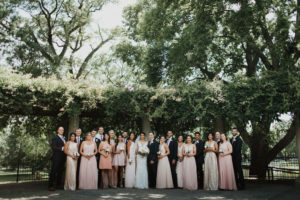 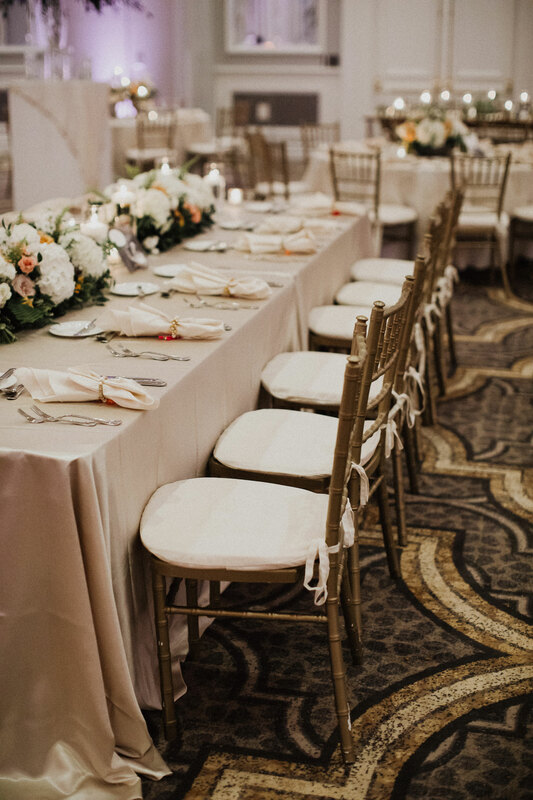 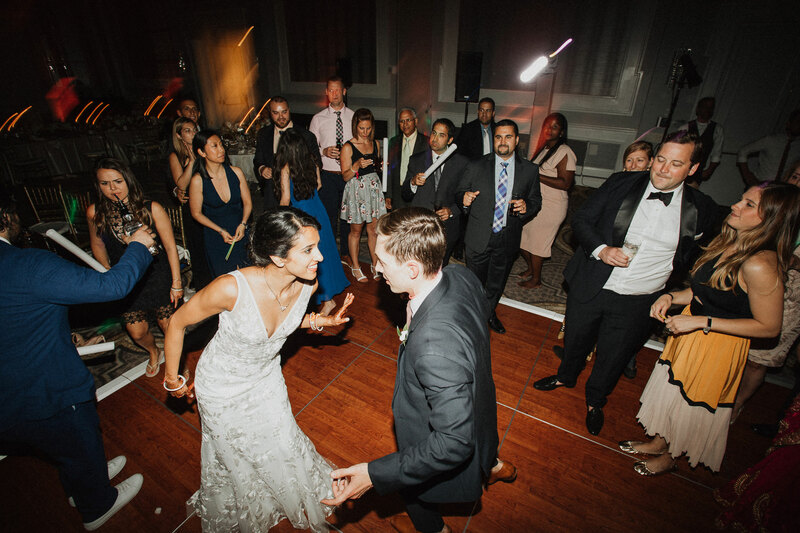 The bridal party traveled for photos, and guests enjoyed cocktail hour…and we transformed the room. 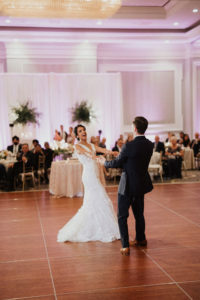 The reception ballroom was a beautiful mix of both ceremonies with deep reds, mauve, rose, whites and gold. 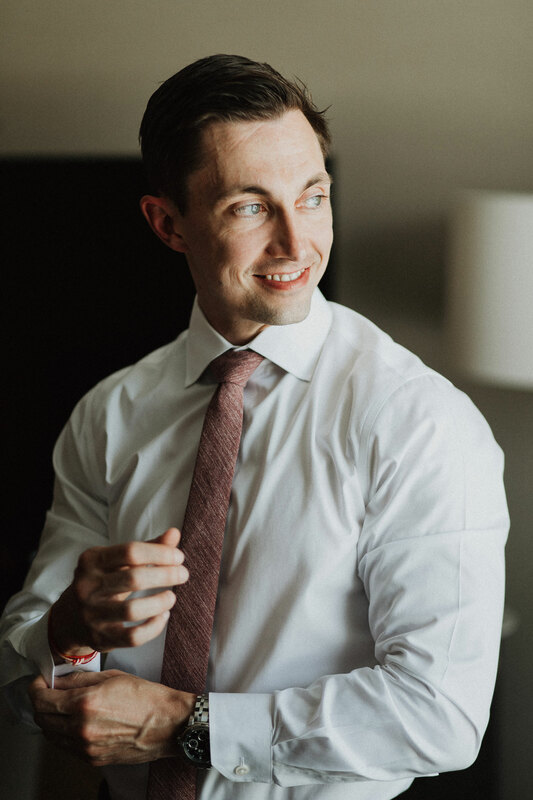 We wanted to pull it all together to create one cohesive look for this part of the wedding day. 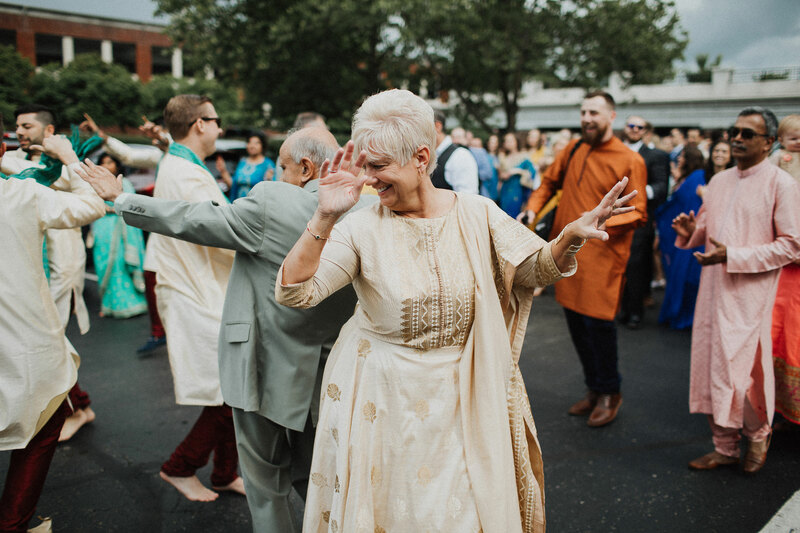 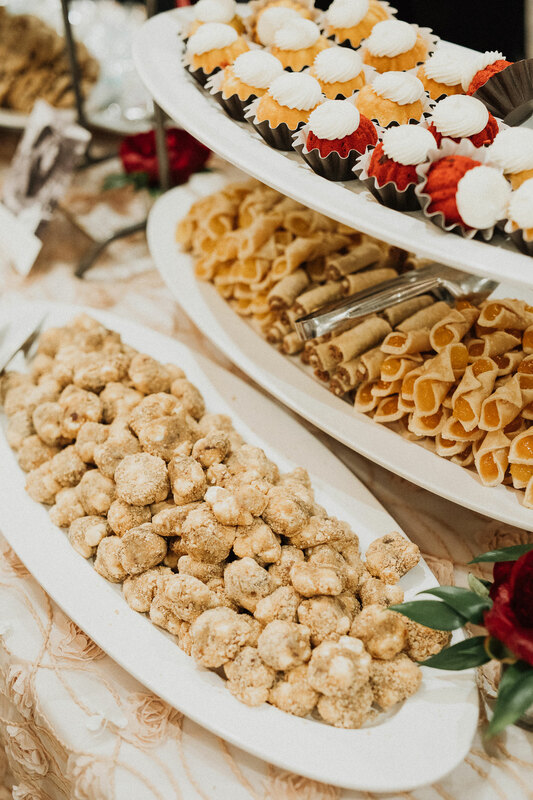 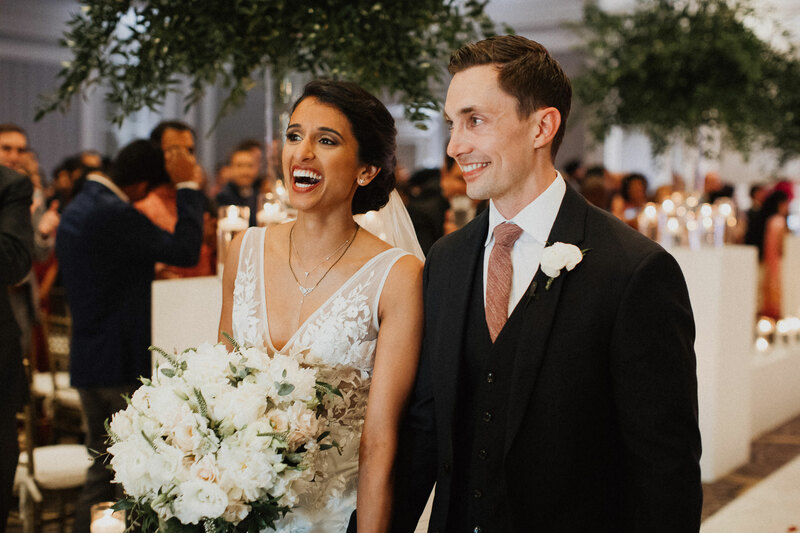 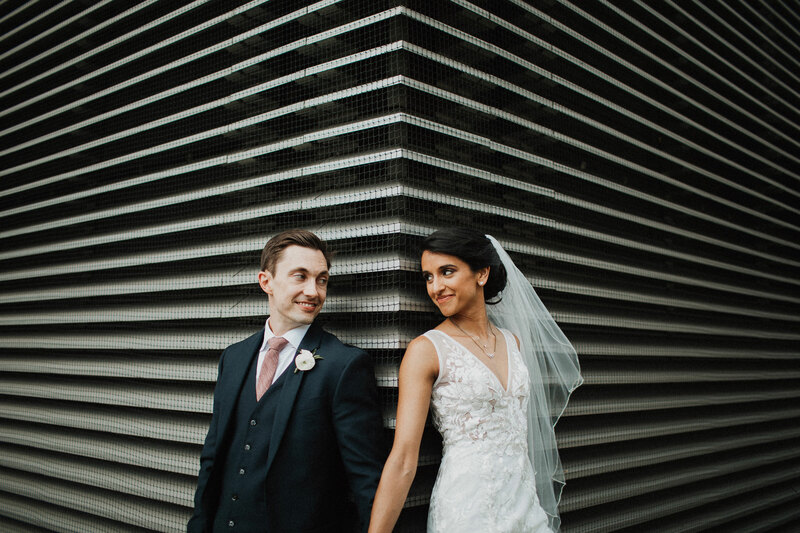 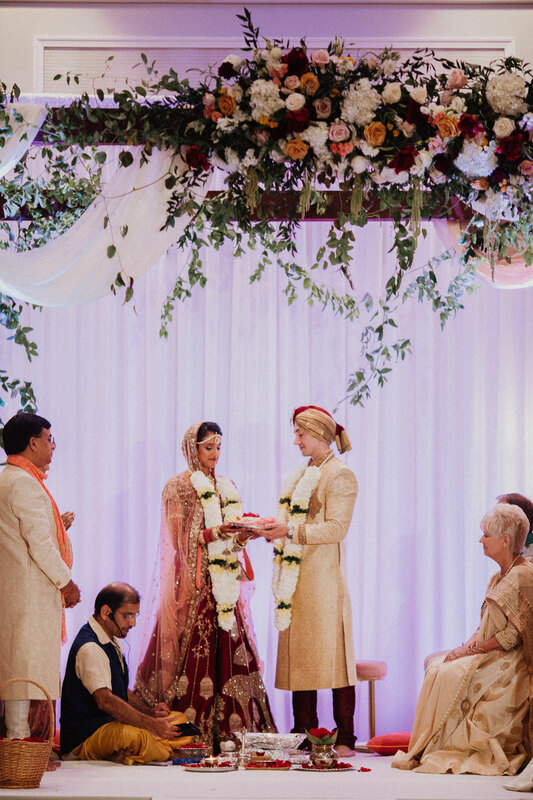 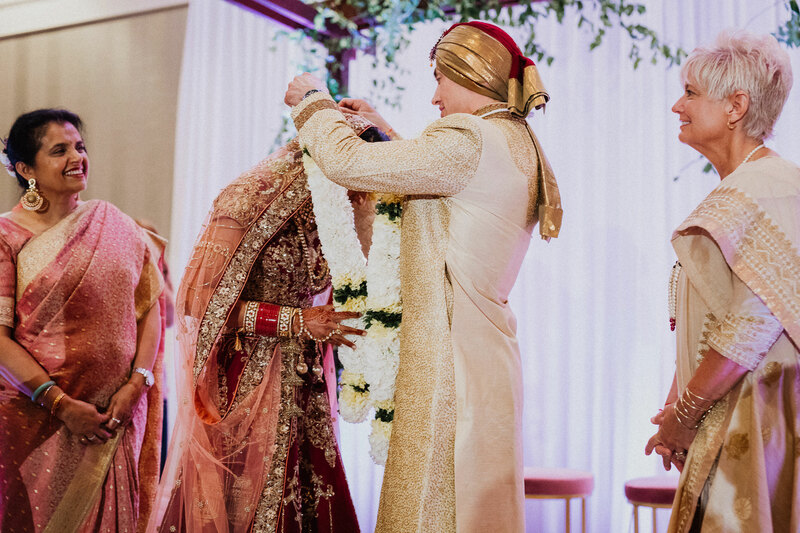 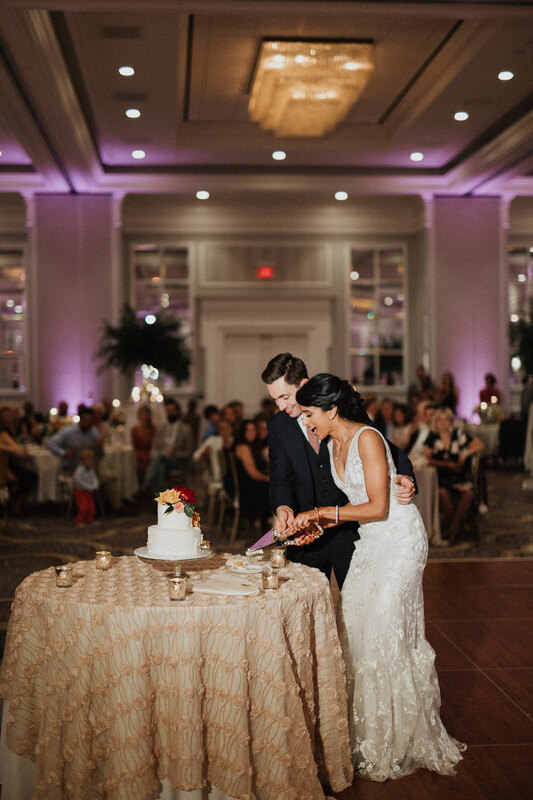 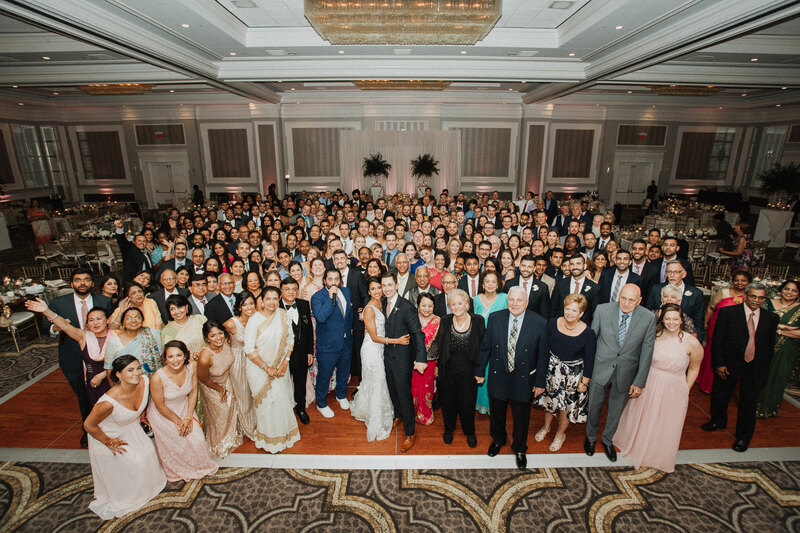 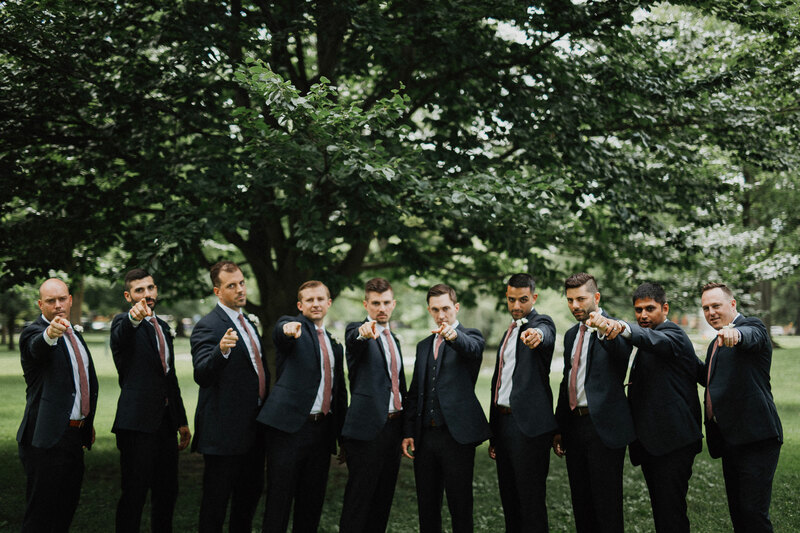 This is where a lot of personal details came into play – it wasn’t just another Indian reception – everyone knew this was Natasha and Ronnie’s party! 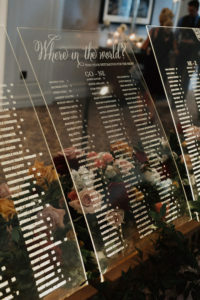 They chose destinations for their tables in leu of basic table numbers. We had an acrylic seating chart that was stunning, telling each guest their “destination” for the evening. We brought the outdoor farm style to the ballroom with some rented farm tables mixed with rounds and banquet style tables for dinner. 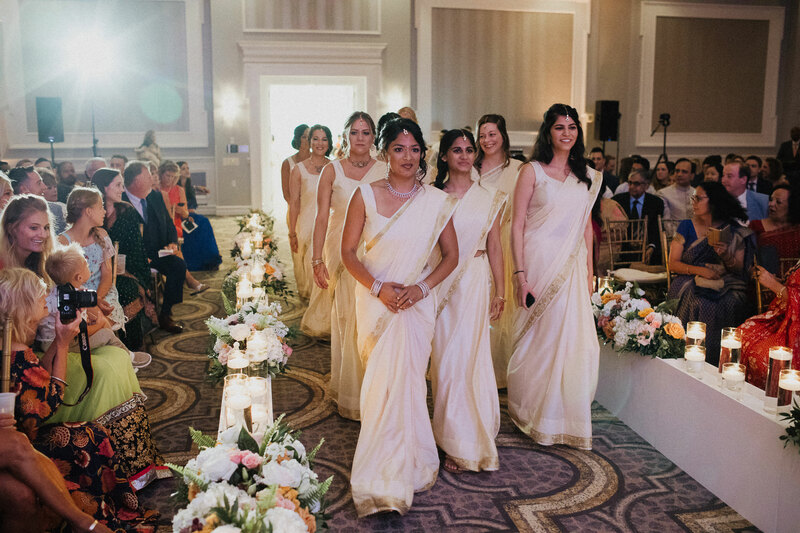 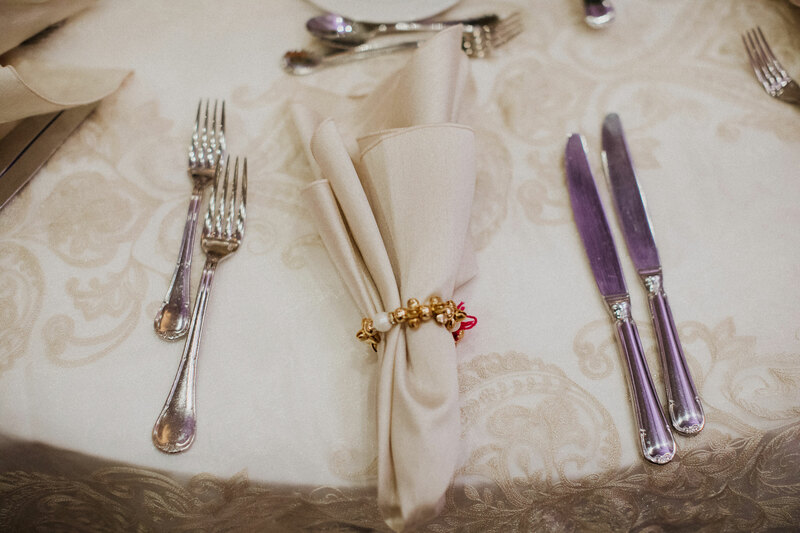 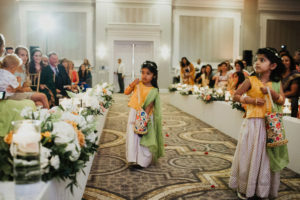 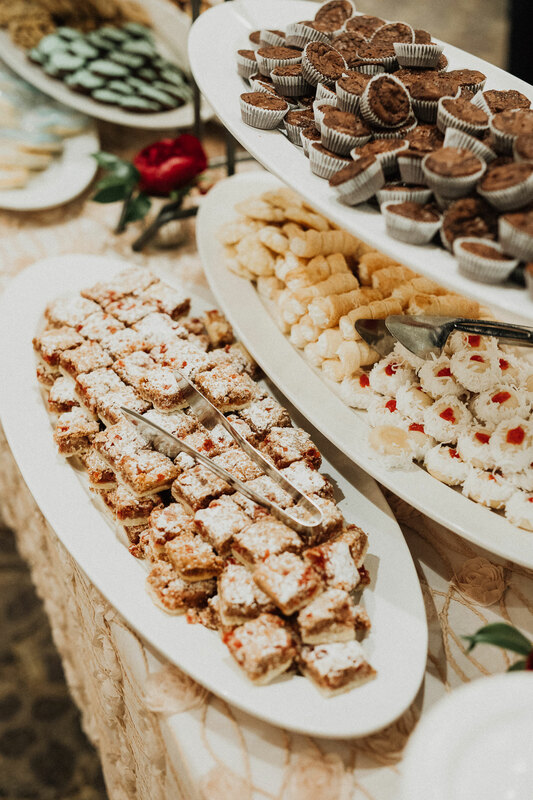 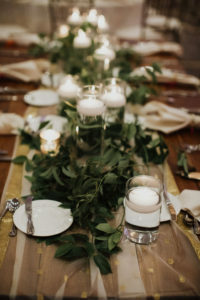 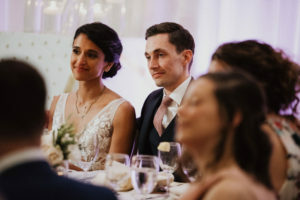 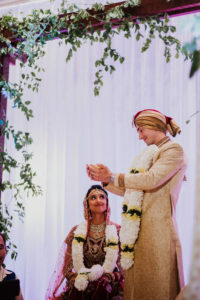 While Natasha’s family brought handmade runners from India and each table setting was adorned with a napkin wrapped in a handmade Indian bangle. 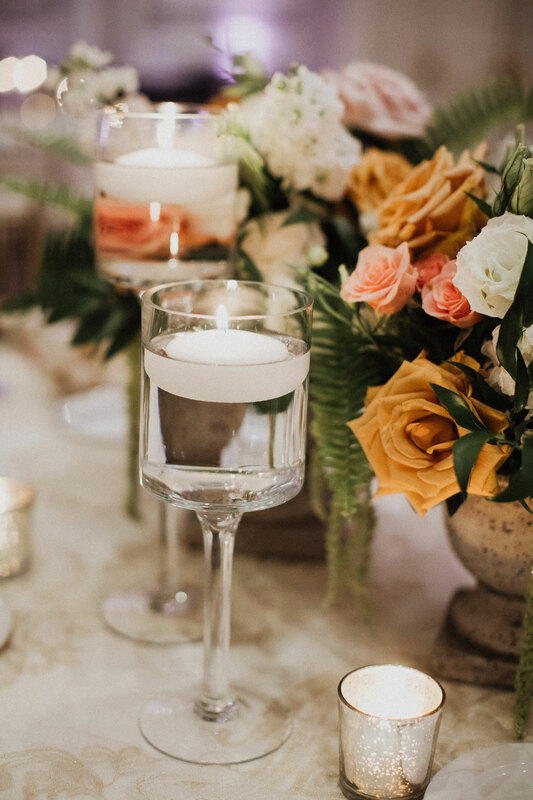 The florals were lush arrangements with lots of candle light and huge pops of greenery. 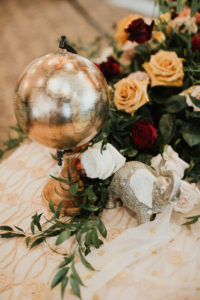 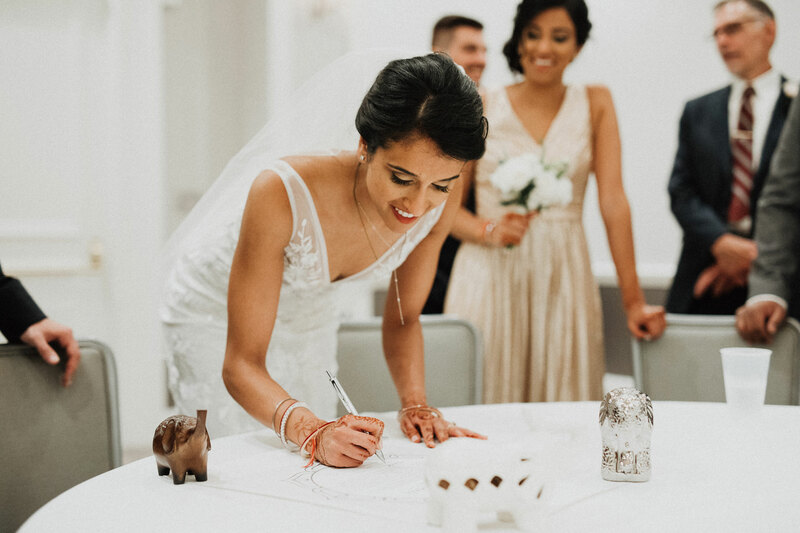 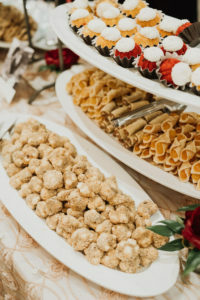 The stationery design was unique and perfect for Ronnie and Natasha – we brought the elephant silhouette through all the paper items and brought in wood, acrylic and jeweled elephants to pull it all together at the reception. 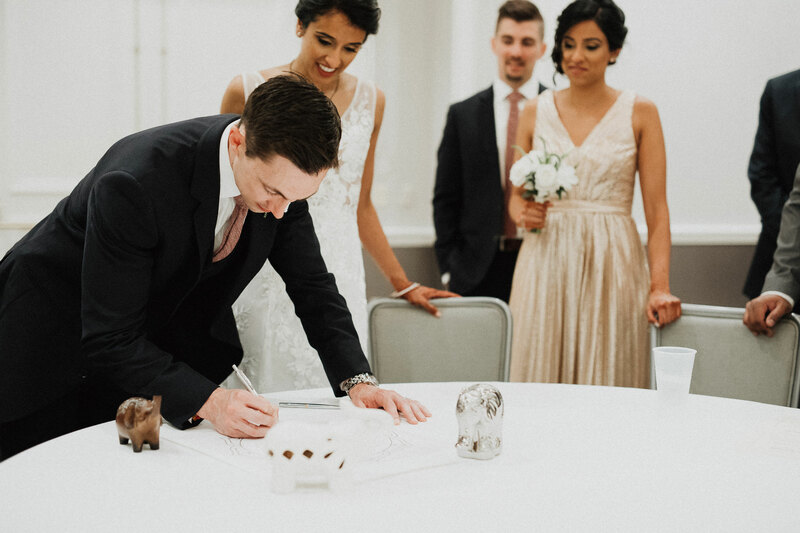 One of my favorite personal touches was a custom made marriage document designed with the same mandala from their invitation – it was Natasha’s idea, that never came to fruition, so we designed it and surprised her and Ronnie with it after the ceremonies. And, Ronnie’s family brought the cookie table to Columbus! 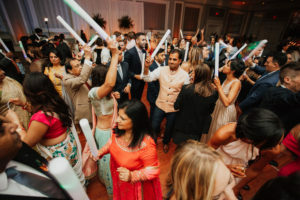 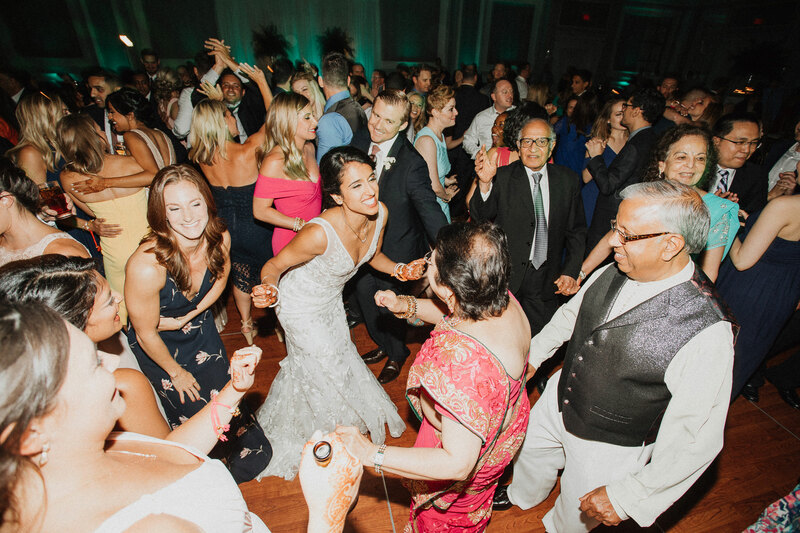 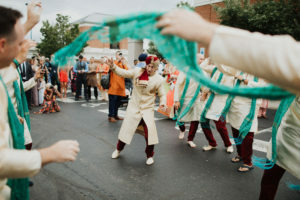 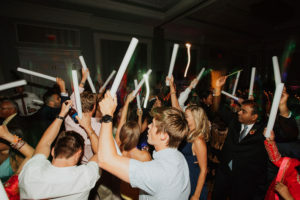 DJ Mavi Entertainment brought the party to life from the baraat to the last dance. 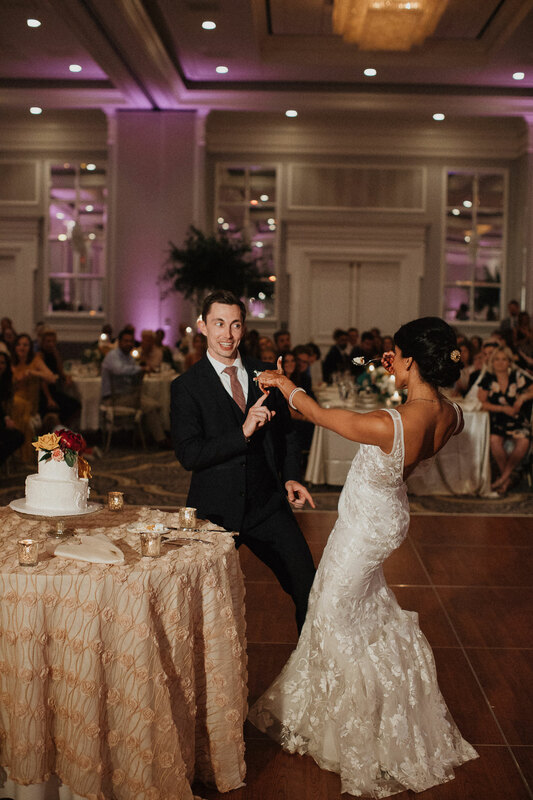 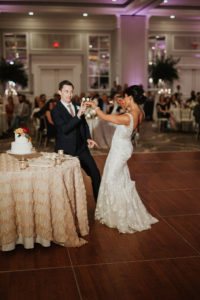 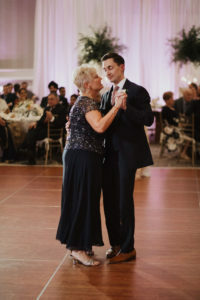 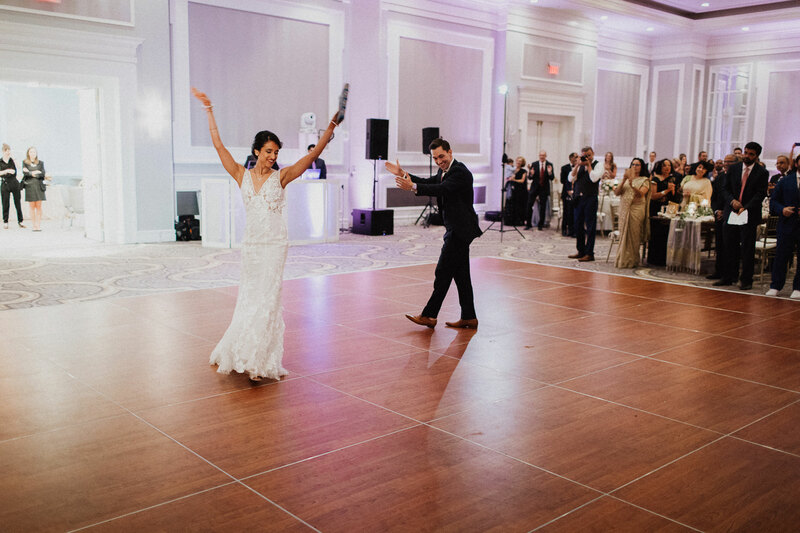 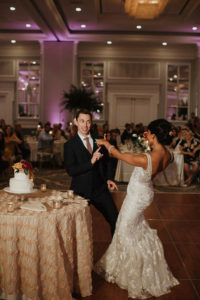 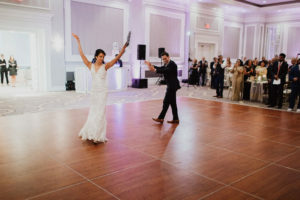 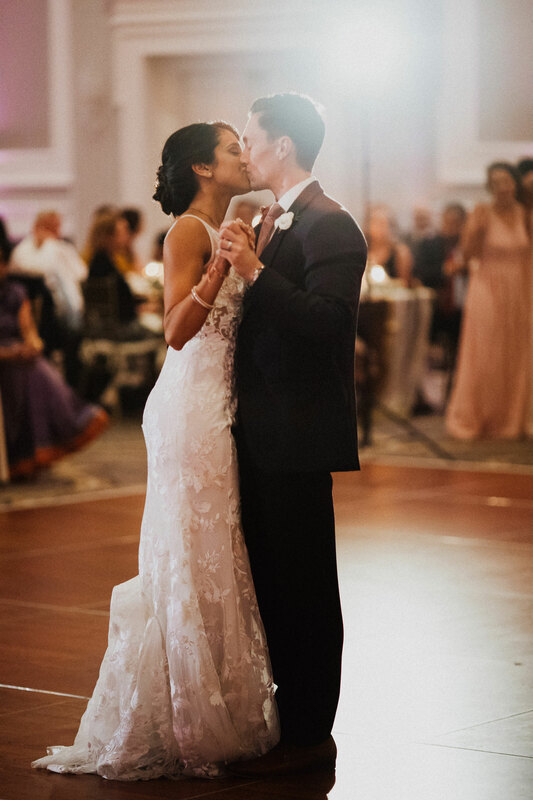 Then Natasha and Ronnie, along with their closest family and friends, danced the night away as they began their new life together. 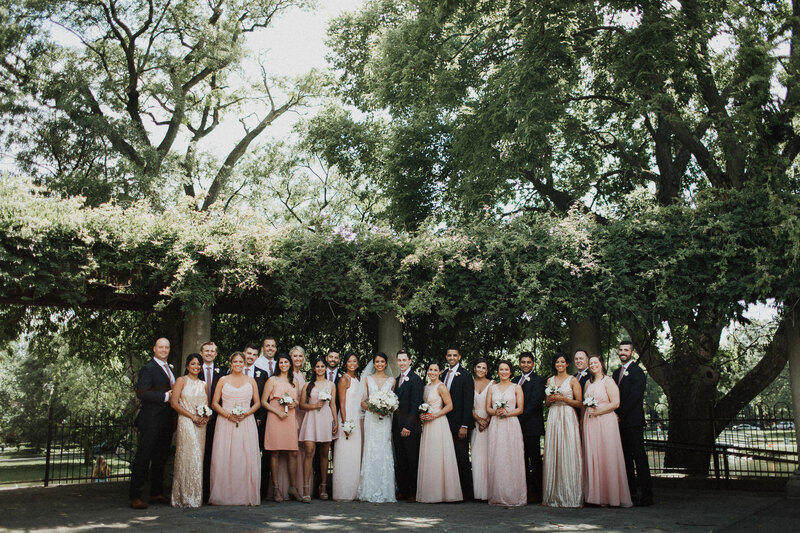 Thank you to all of our incredible vendors, and congratulations to Natasha and Ronnie!